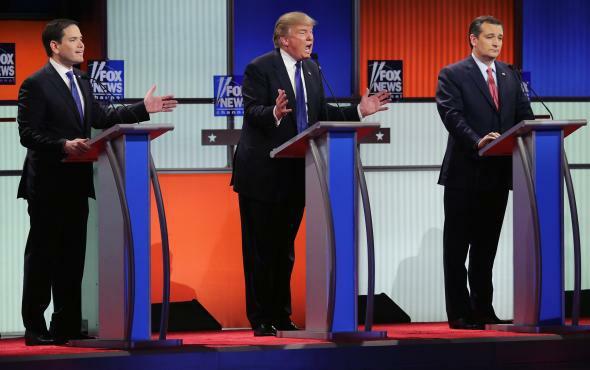 Fox News can't decide what it thinks of Donald Trump in GOP debate. Republican presidential candidates Marco Rubio, Donald Trump, and Ted Cruz at the Fox News GOP debate Thursday in Detroit. Donald Trump may never be president, but we are living in his America. Thursday night’s exhausting and pathetic two-hour debate in Detroit put on display a Republican Party disintegrating before our eyes, and enough personal insults and crude boasts to shame Howard Stern. It was nearly enough to make one sympathize with Mitt Romney’s borderline sappy, straight-outta-1955 plea for civility earlier in the day. If the campaign that Trump has dragged down into the gutter no longer surprises in its lowness, the confusion at Fox News Channel, the network that (barely) hosted the debate, remains one of the most shocking things about this bizarre election year. For the past several months, from the time Donald Trump’s campaign went from an absurd joke to a frightening reality, Fox exhibited two things that it has never exhibited before: irresolution and utter perplexity. Trump not only shunned the traditional Republican playbook—a playbook that Fox News has tried to enforce for two decades—but also attacked a number of the channel’s personalities, including one of its biggest stars, Megyn Kelly. Fox was at a loss: Should it try to take Trump down, and risk alienating its viewers? Or should it go along with the man who not only was changing the party and challenging its establishment, but also seemed unlikely to beat Hillary Clinton in a general election? The result was a network that often seemed unmoored, with bickering anchors, different factions, and no game plan about what to do. Finally, Rupert Murdoch, who owns the network, stated that the party had to unite, which in practice (given the polls) means that it had to unite around Trump. Roger Ailes, who runs the network, soured on Marco Rubio, according to Gabriel Sherman’s reporting in New York magazine. (Within 24 hours of that report, Sean Hannity, one of the network’s big stars, turned harshly against Rubio.) And Bill O’Reilly, who had been cautiously pro-Trump for months, was particularly gushing about the candidate this week. In its campaign coverage on Thursday—one of the biggest days of the 2016 election—Fox consistently went out of its way to ensure that Trump had a smooth ride. Mitt Romney’s speech blasting Trump, which dominated news coverage all day, was covered skeptically on the network. Bill O’Reilly tried to get all of his guests to pledge support for Trump. Even Fox’s so-called establishment contributors, such as former Bush press secretary Dana Perino, spoke harshly about Romney’s speech. When the actual debate began, it seemed as if the Fox strategy would continue as it had all week. Bret Baier, one of the moderators, went after Rubio on the second question, asking him, inanely, “How many jobs have you created?” Frank Luntz, whose ridiculous focus groups throughout the campaign have consistently boosted Rubio, tweeted out that this time the group did not like Rubio’s attack on Trump. But the pro-Trump strategy either fell apart or was never solid in the first place. The network’s moderators spent the middle hour of the debate slicing and dicing Trump: exposing the phoniness of his promises to cut the budget, confronting him with his past statements, playing sustained video clips of him flip-flopping. They offered his rivals an endless number of opportunities to attack him, which they did relentlessly. It became clear that the main purpose of the debate was to launch sustained and brutal attacks on the front-runner. Kelly’s attack on his business practices went on and on—and Trump sputtered and sputtered. It was a superb performance from Kelly, who, despite her very serious shortcomings, is capable of excellent journalism when she chooses. All of those attacks—and all of Fox’s questions—may do as little to damage the front-runner as everything else in this campaign. But whether or not they do, Fox emerged from a long political day appearing as uncertain as ever about how it would proceed going forward. The only conclusion, in the end, is that neither Murdoch nor Ailes is exerting real control over the network. In short, it’s a mess, a lot like Thursday’s debate was. Even Luntz, a loyal (if useless) soldier if ever there were one, tweeted out an alternate moderator because the evening had become such a ridiculous circus. He’s been dead for 125 years, but P.T. Barnum would be an excellent moderator for tonight’s #GOPDebate.